different character called Egghead, whom Tex Avery created as a bizarre figure with an egg-shaped head, a squat body and a long, bulbous nose. His voice, provided by Cliff Nazarro, was patterned after the radio comedian Joe Penner. Before Egghead underwent his complete transformation, Mel Blanc briefly provided his voice, dropping the Penner-like intonations. 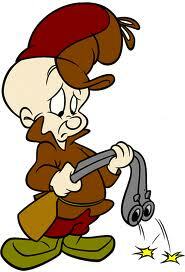 Egghead first had the name "Elmer Fudd" in A Feud There Was (1938). Chuck Jones and his team redesigned him for Elmer's Candid Camera (1940) as a more human-like character and cast Arthur Q. Bryan to provide his babyish voice, which made ls and rs sounds like ws. But audiences first saw the redesigned Elmer Fudd in Tex Avery's A Wild Hare (1940), which was made after Elmer's Candid Camera but released before. In A Wild Hare, both Elmer and Bugs Bunny became the characters we know and love today. They've since been refined, but nothing essential has changed since 1940. In a few early cartoons, such as Wabbit Twouble (1941), Elmer Fudd is extremely fat, but still very recognizably Elmer. Elmer Fudd is best known as Bugs Bunny's foil. With his childish personality and extreme stupidity, he is never a match for the wily Bugs (which is why Friz Freleng soon abandoned him in favor of Yosemite Sam). He's especially ludicrous in his most typical role, as that of a hunter. Elmer also appeared opposite Daffy Duck in the 40s and played in a trio of Chuck Jones films with both Bugs and Daffy in the 50s. He has filled miscellaneous roles, such as a flea-bitten dog's master in An Itch in Time (1943), the title god in The Stupid Cupid (1944) and a parody of Deems Taylor in the Fantasia spoof, A Corny Concerto (1943). Most of the Warner Bros. cartoon directors used him, including Jones, Freleng, Frank Tashlin, Robert Clampett and Robert McKimson. Arthur Q. Bryan was Elmer's voice for nearly two decades, using a characterization he had created for radio. Prior to Elmer Fudd, he had provided this voice for the title character in Tex Avery's Dangerous Dan McFoo (1939). Twice in Bryan's lifetime (not counting the Egghead shorts), in The Scarlet Pumpernickel (1950) and Pre-Hysterical Hare (1958), Mel Blanc provided the character's voice. After Bryan's death, Hal Smith took over Elmer Fudd for two cartoons, Dog Gone People (1960) and What's My Lion? (1961). In Crows' Feat (1962), Fudd had no lines, no voice at all, and then the character was retired, appearing in no further theatrical cartoon shorts for almost three decades. Since the classic period for Warner cartoons, Elmer has appeared in various TV specials, TV series and theatrical releases. Blanc, Jeff Bergman, Greg Burson and Billy West each have given him voice, always mimicking Bryan's original portrayal.